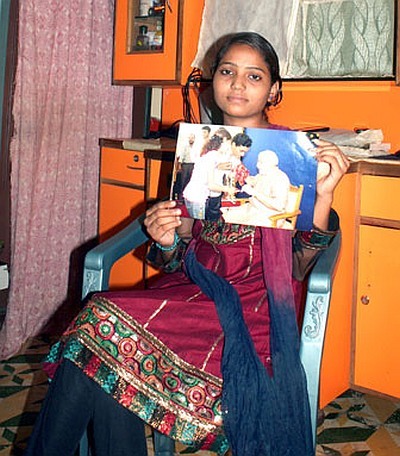 Twenty-year-old Ripal Prajapati, the bubbly Chandlodia girl, had to settle for mailing a ‘rakhi’ to her god-brother Narendra Modi, in New Delhi this year. This was the first time in 10 years that she did not tie the rakhi in person. This hasn’t dampened her spirits though. She and her family are hopeful that she will be in New Delhi next year for the Rakshabandhan celebrations. In its humble home at Chandlodia, on the northern fringes of Ahmedabad, the Prajapati family believes that the prime minister must have missed seeing their fax requesting an appointment. But everything else was planned. The family was even willing to take a flight to Delhi for the event, in case the invitation came in at the last moment. Some of the customers at the flour mill run by Ripal’s father, Bhupendra Prajapati, had offered to fund the travel, he claims. All this began one afternoon, when a 10-year-old girl watched Modi on television and told her father that she wanted to tie a rakhi on the wrist of the then chief minister of Gujarat. An enterprising father, Prajapati almost immediately faxed the Chief Minister’s Office (CMO) in Gandhinagar, and an invitation from Modi’s office came soon after, inviting Ripal to Gandhinagar. This was back in 2004, and the tradition has continued since. “There has never been a year when Ripal has not celebrated Rakhi with Modiji, and we did not want to break the tradition this year. So, I sent a rakhi and a letter by post to him in Delhi,” Prajapati says. He has been meticulously maintaining all documents and photographs of his daughter’s association with Modi, and it’s hard to miss the sense of pride in his eyes when he shows them to me. Ripal, all dressed up to meet me, poses coyly for photos and cannot hide her excitement whenever the mention of Modi comes up during our meeting. “I feel as if my year wouldn’t go well if I do not meet Modiji at least once,” she says. Her father adds that Ripal was at the examination hall when her father picked her up and rushed in an auto-rickshaw to Gandhinagar to meet Modi. This proximity has earned him the reputation of the ‘go to’ man in the neighbourhood, in case of any dealing with government agencies. Prajapati claims that he has solved a drainage issue in the locality by connecting with Modi during one of his ‘Lok Sampark’ (public connect) sessions. He has a sharp memory and remembers people and incidents well, the family claims. “People call him ‘computer dimaag (brain)’ here,” says Ripal. “In one of our meetings, Modiji told me, ‘you study hard and do not worry about jobs’,” she says. It seems every encouraging word the leader ever said to this young girl has been strongly etched in her memory. She is about to complete her graduation in the commerce stream, and aspires to pursue a career in chartered accountancy. Modi has touched this family’s life in a way that he is almost a part of its everyday existence, almost making the Prajapatis a part of Modi’s extended family in Ahmedabad. The entire living room of the house, an eight-by-six feet area, which also doubles up as a bedroom (with two small cots placed by the wall), is filled with framed pictures of Ripal and Modi. Tara Prajapati, Ripal’s mother, squats on the floor, and earnestly listens as her husband and two daughters (Ripal and elder sister Roshni) share stories about Modi. She is the only one from the family who has not met Modi in person. “Ma will meet him in Delhi, if we can go next year,” Ripal says, and Taraben’s eyes light up. As the Prajapatis wait for 2015 to meet Modi, only time will tell if their wish would come true. 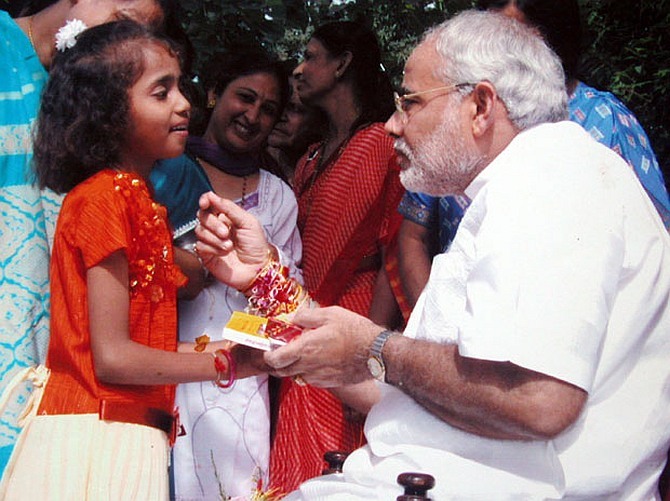 The prime minister had spent the Rakhi day this year connecting with women across the country, including widows from Vrindavan and Varanasi. As Modi’s canvas widens with every passing year, it would be interesting to see how many such old associations from Gujarat can Modi carry along.